1) 3D games like the upcoming Spore (and, of course, free-form social environments like Second Life) let users create some pretty cool stuff. 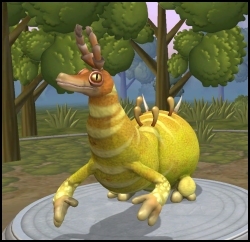 For example, I created this little guy to the right in about five minutes using the trial of the Creature Creator tool for Spore. The ability to create cool 3D stuff is going to become more prevalent in games and virtual worlds because users now demand customization options. Even where you’d not expect it — like Madden ’08 or a racing game — a lot of players spend a lot of time customizing. Madden players create custom uniforms and accessories, and the car customization in Forza Motorsport 2 appears to trump actual play for some users. Wherever there is customization available, potential trademark and copyright infringement is fairly common — as the links above demonstrate. 2) In most games, you agree — via a clickthrough screen — that you have no ownership over the cool stuff you create. Even if you aren’t ripping off Lost or Nike (see links above) and are only doing original creations, you have to be careful about intellectual property issues. Sometimes (like in Second Life) the Terms of Service allow you to retain ownership of the intellectual property in your in-world creations. For most games, though, the Terms of Service and End User License Agreements say you own absolutely nothing. EA owns all of the right, title and interest in the Spore Creature Creator, the assets included in the Creature Creator for building and animating creatures and for creating backgrounds and video clips, and all derivative works comprised of those assets, including the Spore creatures that you create, animate, and capture in screen shots or video clips using the Spore Creature Creator. 3) We’re getting close to consumer-level 3D fabrication technology, which will let you make plastic 3D models (a.k.a. professional-grade home-made toys) based on that cool stuff you create on your computer. The technology is already reasonably priced for small businesses, and in fact, one company, Fabjectory is already selling plastic versions of Second Life avatars. I’ve just started to wrap my head around this, but I see at least a couple of legal issues here right off the bat. The obvious one is that people are going to be able to “print” (and sell) Spore and other game creations in violation of the games’ Terms of Service and EULAs. The less obvious one is that this raises the stakes for copyright and trademark infringement in open-creation spaces — a lot. Once people are “printing” Batman and Harry Potter toys they’ve created in Second Life (rather than buying the ones DC Comics and Warner Brothers have licensed for sale at the mall) license holders will be further motivated to pay close attention to how their intellectual property is being represented in-world. Thanks to reader C. Sven Johnson for the heads-up on this. Sven maintains the thought-provoking reBang weblog, where he covers product design, mixed reality, and lots of other cool stuff. I could definitely see myself buying one of these printers to make little army men of the avatars I hate… and I can set em up around my office and shoot with rubber bands and fling staplers at. Or, better yet, I can produce voodoo dolls of the avatars I hate and try to light em on fire….. by turning on my windlight, then holding a magnifying glass near the screen. FRY YOU LITTLE PLASTIC ANSHE! FRY YOU M LINDEN! FRY YOU MINI BILL GATES!! I see your point on the legalities… but I don’t think we’ll see a court case involving this until a company is mass producing and selling one specific item they dont have the rights to. It may end up coming down to each company slowly altering their “services” as to not appear to print anything without rights… but if I emailed one of these companies and said “yeah, make me a Philip Linden, an Aimee Webber, do one of myself, and throw in a Derek Jeter…. between me and the company, who else would know? and if aimee weber (who has trademarked her avatar) got wind that I ordered a replica… the most she would do is tell the company they are not allowed to recreate replicas of her. I don’t think a court case would come from a doll. So, legally… there is a line that is going to be crossed for awhile, then skirted on for a long time. by the way, in my first post, I simply pointed out names of prominent people just for the joke….. I personally an cool with each of the people I mentioned in post #1…. …. so years later when one of em above finds some old google cache of the reply #1…. this post #2 is my TOS. …. law…. jeeez… all these rules…. it will be another decade before the home printers will be popping out “hasbro level” star wars figures youd let your 6 year old play with…. both materials, costs, and liabilities from the printer manufactures will factor in..
but for now the ip issues of the virtual object are of more presssing concern for those whos industry it is to create IP and entertainment…. everything has a cost.. even if it seems free…..
but it continues to seem that the obvious is again beyond the reality of those most vocal about the virtual in their quest for their web2.0 influence or fame. clickable culture has a horrid blog about this. shows the writers inexperience in reality and the depths of his delusions as to the value of the virtual. Good post, you / some of your readers may be interested in my blog http://www.ipfreely.com. It is only new but I have done a great deal of work previously on virtual worlds and IP and will be making this a focal point of the blog. Congrats on landing that domain name too! I think it’s prime web domain uberness.